...the Seven Species (shivat haminim) described in the Bible as being abundant in the land of Israel. 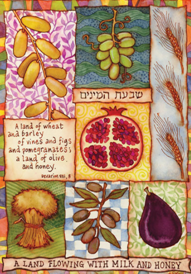 The Shivat Haminim are: wheat, barley, grapes (vines), figs, pomegranates, olives and dates (honey) - Deut. 8:8. You can make a nice vegetarian pilaf from the shivat haminim: a bed of cooked bulgur wheat or wheat berries and barley, topped with figs, dates, raisins (grapes), and pomegranate seeds, served with a dressing of olive oil, balsamic vinegar (grapes) and pomegranate juice. How ironic that all of these foods show up in a skip code in the Bible, as demonstrated by Dr. Vogt. It does look like survival food, doesn't it?